A very special audio. It performs a deeper healing of wounds that may have occurred out of stresses experienced minutes ago to years ago. "Healing Mind:Healing Body" is a very special audio. It performs a deeper healing of wounds that may have occurred out of stresses experienced minutes ago to years ago. Our life experiences are a collection of emotional reactions (good and not-so-good) that influence patterns of behavior and body conditioning. That is, every experience we collect on this road of life has an emotional and physical impact upon our mind and body. Our bodies accumulate a form of learning (called "conditioning") that subconsciously replays a pattern of stress-induced responses over and over, without our conscious awareness of where and why our body learned to do this. For example, we might develop headaches, upper or lower GI symptoms, asthma, skin reactions, anxiety, etc because of situations and circumstances that were or are beyond our control. As we handle those stressful or emotional events, we do our best to put those stresses "out of mind" but that doesn't necessarily put them "out of body." In fact, our body will remember its response to those stresses (and other stresses) until we un-learn the response by re-learning something healthier and more comfortable. That is where this audio program goes into action. "Healing Mind:Healing Body" guides you into a lovely trance and refreshing relaxation response wherein the re-learning of the healthy responses occur. The negative patterns are thus erased, replaced by the positive experience of comfort and new learning for healthy and comfortable performance. This is a great audio for not only reducing and replacing stress responses; it is also wonderful insulation or innoculation to protect against the effects of stress. I am proud of this audio. Note: it runs longer than most of my other programs at about 42 minutes. Dr. Steven Gurgevich is a psychologist specializing in Mind-Body Medicine and Clinical Hypnosis. He is Clinical Assistant Professor of Medicine and Director of the Mind-Body Clinic at the University of Arizona College of Medicine in Dr. Andrew Weil's Program in Integrative Medicine. He is a Fellow and faculty of the American Society of Clinical Hypnosis, and a member of both the Society for Clincal and Experimental Hypnosis and the American Psychological Association. Dr. Gurgevich and his wife, Joy, have a private practice at Behavioral Medicine, Ltd. They live near Sabino Canyon National Park in Tucson, Arizona. I love this CD! I've been struggling with some very serious issues for so many years, and things can seem so hopeless and overwhelming at times. I started listening to this CD at night to help me fall asleep. After listening to it for several nights, I discovered that it did more than help me fall asleep. I realized that Dr. G's Healing Mind and Body CD was teaching me how to "unlearn" years of negative thinking habits and self-destructive behaviors. I am truly grateful for this CD! It is helping me to see exactly what I need to do in order to get better. But most importantly, it is teaching me HOW to help myself get better. Use daily as directed. You will feel a difference immediately. After using another self-hypnosis CD from this artist, I had to try this one. I am very pleased with it, and was amazed at how it helped with all those health issues I've just been learning to live with. Even if it weren't helping my health, I'd use it for the deep and nourising sleep it has given me. This is a real gift. I have not had a CD that started out making a change so soon. I recommend this to anyone. 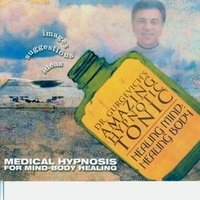 This is the best hypnosis or meditation CD I have ever owned. I have numerous health problems and the symptoms were minimized when I listened to this CD regularly. Highly recommended! Unreal. This is one of the best medicines I have ever taken. Dr Gurgevich empowers you to understand you can take control of your own healing. I have headaches, abdominal pain and anxiety and all three are heading out of my body. I am truly grateful to Dr. Gurgevich. His narrative is like a mother's lullaby too! Totally relaxing. First time in doing hypnosis, I was amazed how quickly I went into a trance. It was unbelievable how the muscles were twitching in one leg and finally it stopped. Listened to this at bedtime but instead of going right off to sleep, I was refreshed and ready to start another day. My doctor recommended hypnotherapy for my numerous problems (skin, IBS, GERD) and nervousness. When he said hpnosis, i got scared. But now I have been using this CD every day for over three weeks; and I have never felt better. My skin is looking good, I am eating and sleeping better, and by bowels have calmed down to normal. I haven't felt this good in years. I am so thankful that my doctor recommended "healing" instead of more drugs. and I am not scared, I am relaxed and optimistic. G.A.